where is Boltzmann’s constant and is the elementary charge . 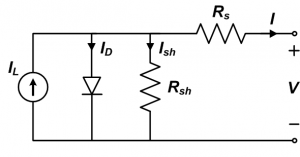 where and are the current and voltage, respectively, of the module or array. Care should be taken when implementing model parameters, as they are either applicable to a cell, module, or array. Parameters for modules or arrays are strictly used with the single diode equation for , which is the more commonly implemented form. 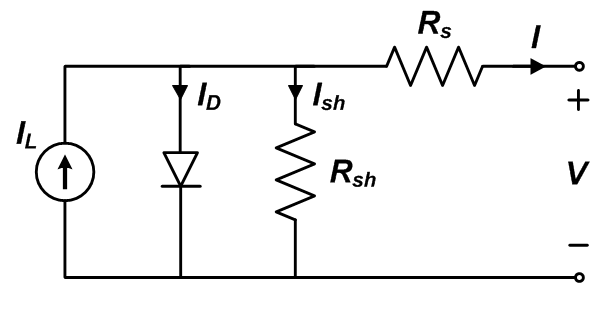 The following equivalent circuit module models are described. These models have been proposed with different sets of auxiliary equations that describe how the primary parameters of the single diode equation change with cell temperature and irradiance. Module models, or those with parameters applicable to a module using , are examined here instead of those for cells or arrays because module models are the basic performance models used for modeling arrays in PV modeling software packages.